On Saturday, March 5, the Wake Forest Men’s Rugby club will take on the University of Maryland on Poteat Field, marking the first home game for the team as participants in the Atlantic Coast Rugby League (ACRL). The league began its first season this spring after officially forming in mid-2010. Nine of the twelve men’s rugby teams from universities in the Atlantic Coast Conference are competing. In October 2009, rugby Sevens was voted in as the newest Olympic sport and will make its first appearance in the 2016 games in Rio de Janeiro. The idea for the league started in 2008 when nine men’s rugby teams from universities in the Atlantic Coast Conference participated in a weekend Atlantic Coast Invitational Tournament which Kane and his colleague Andy Richards co-founded. 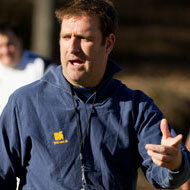 Richards is head coach of Virginia Tech men’s rugby program. 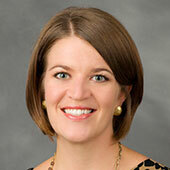 Kane and Richards worked together to create the ACRL, the second rugby league in the nation that mirrors a traditional NCAA athletic conference—the first being the Ivy League, which was founded in 2009. 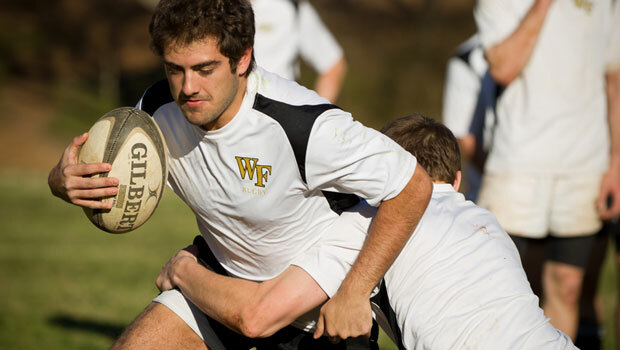 Kane, who is an associate at Smith Moore Leatherwood LLP in Greensboro says directing and coaching Wake Forest rugby is his second “full time job.” “I can only do it because of my family’s commitment to Wake Forest rugby. We spend our weekends traveling wherever the team is playing.” At least this weekend, they won’t have to far to go. The ACRL is not affiliated with or endorsed by the ACC and is a completely separate, unrelated entity.